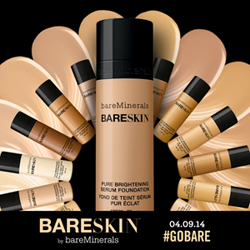 Make everyday luminous with bareMinerals BareSkin, a Brightening Serum Foundation and Perfecting Face Brush duo that allow you to Shake, Drop, Buff™ your way to complexion perfection. Featuring 20 skin-perfecting shades, the foundation is formulated with Minerals, Lilac Plant Stem Cells and Vitamin C that are proven to improve the appearance of skin, both with and without make-up. With a specially designed brush and a beautifully tactile formula, you’re just a few drops away from a transformed complexion.